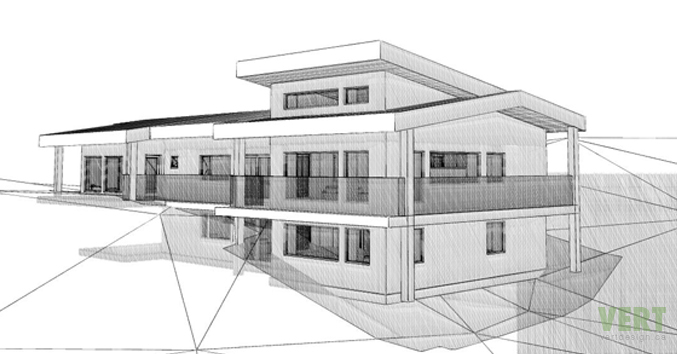 New detached home certified to the passive house standard on a previously undeveloped property. Home has perfect southern exposure, overlooking the Gananoque River. The north wall is built into a hillside, providing protection against the winter cold from the foundation’s footings to the peak of the roof. The project site is Parts 8, 9 & 10 of Lot 5, Concession 8, in the geographic Township of Lansdowne, in the County of Leeds, Ontario (PIN 358249). The property is known as: Lot 3, 3336 County Road 3, Lyndhurst, Ontario. Access to the the property is from County Road 3, approximately 1 kilometre west of the intersection of its intersection with Black Rapids Road. A right of way (Part 9) from the adjoining Lot 2 bisects the property to provide access to Lot 4. The right of way has been improved with a gravel access road approximately 15 feet wide. A narrower access road branches from the right of way and extends to the waterfront on the subject property. The lot is roughly trapezoidal and of approximately 4.5 acres, with a north (road) and south (water) lot line approximately 280 feet long, with east and west (side) lot lines approximately 835 feet long. A survey of the property was prepared by R. G. Bennett (OLS) on May 17, 2007. Topographical information for the southern portion of the property was collected by R. G. Bennett (OLS) in May 2012. The grade of the lot is variable, rolling upward from the southern waterfront toward the northern boundary. Topographic lines run in a roughly north – south orientation, creating a series of valleys and plateaus. Although the property is covered with an unknown depth of soil, surface observation and some grading for access suggests that soil depth varies from a few feet to exposed rock (i.e. no overburden). Drainage on the property is excellent, with the exception of an area east of the access road’s intersection with County Road 3, at the very northwestern corner of the property. The property is covered with low vegetation and trees typical of the Great Lakes – St. Lawrence forest region in a plant hardiness zone of 5. A gravel access road from bisects the property . A variety of mature deciduous trees inhabit the rear portion of the lot. Although logging has likely occurred on the property, the resource extraction history of the site is unknown. No buildings exist on the property. An easement occupied by suspended electric lines bisects the property. A mobile home trailer is stationed on the property. An outhouse with composting toilet and an antenna tower have been constructed on the southern half of the property, adjacent to the electric lines.